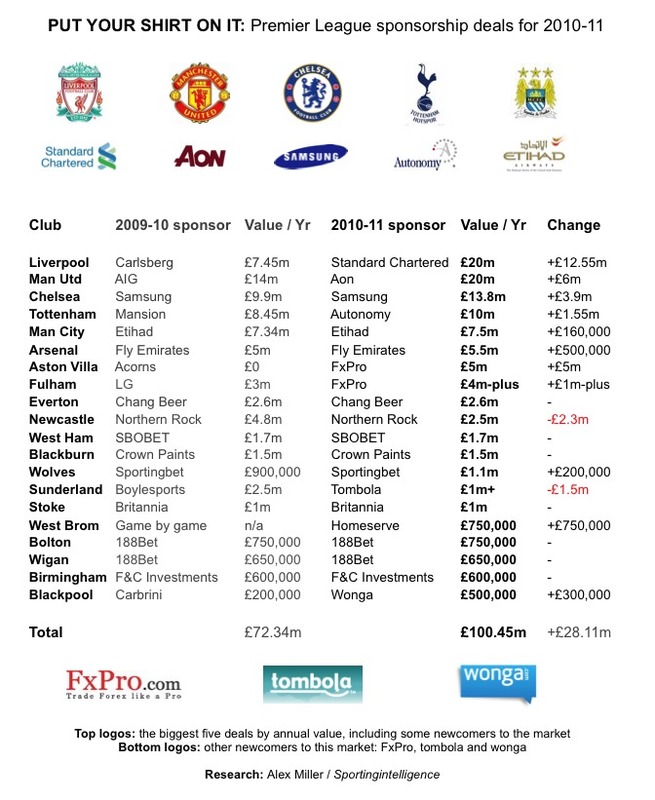 As our exclusive table below shows, the Premier League has once again defied the wider economic climate, with a raft of teams improving the terms of their shirt sponsorship deals for the coming season, to set new financial records, as this website reveals today here. 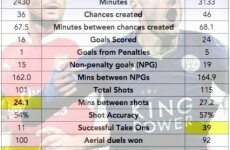 Before a ball has been kicked in the Premiership this season, Liverpool and Manchester United could be said to be the biggest winners – in terms of shirt sponsorship at least. The Merseyside club’s new shirt deal with Standard Chartered is worth a mouth-watering £20m a year from this season – a massive increase of £12.55m a year compared to their previous arrangement with Carlsberg. United also have a new £20m a season deal with insurers Aon – replacing the previous arrangement worth £14m a year with AIG. The two clubs have moved streets ahead of their rivals’ deals, because the next most valuable shirt sponsorship is Chelsea’s £13.8m a season deal with Samsung. Other big commercial winners this season include Tottenham Hotspur after the club signed a £10m-a-year deal with Autonomy. Interestingly, this deal only includes Premiership games and an alternative sponsor is expected for cup games – adding even more money into the North London club’s coffers. This type of split shirt sponsorship arrangement may become a blueprint for other clubs going forward. Aston Villa have signed with FxPro in a deal believed to be worth £5m per year. The deal sees FxPro replace children’s charity Acorns on the claret and blue shirts; that deal was widely applauded for boosting the profile of the charity, but denied the club a valuable revenue stream. FxPro will also sponsor Fulham, joining 188Bet in sponsoring two teams in the Premier League in the same season; 188Bet sponsor Bolton and Wigan this season, as they did last. Villa’s fellow Midlanders West Bromwich Albion have teamed up with Homeserve in a £750,000-a-year deal – following two seasons without any fixed shirt sponsor. The gulf between the big clubs and the smaller clubs in the Premiership is widening and but for the wave of gambling companies – five teams sponsored this season – then it is likely that this gulf would be even wider. 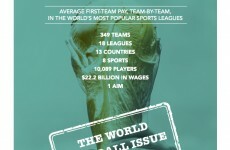 Some observers believe that without the gambling firms entering the market, the value of the deals for the so-called lesser teams could actually have starting falling. The recession is still biting in places, as Newcastle’s lower value deal with troubled bank Northern Rock shows. On renegotiated renewal terms, it’s fallen £2.3m per year in value, year-on-year, despite Newcastle having been promoted. The value of shirt deals varies from club to club in terms of ratio of total income, from two to 10 per cent of club’s annual revenues.